Nicolai Popov Review: Why? A wordless picture book. Nicolai Popov Review: Why, is an effective commentary on the futility of war. The story is a wordless picture book that communicates its message with beautifully rendered pastel images of the countryside populated with gentle looking frogs and mice. But the frogs and mice tend to do bad things to each other and things accelerate rapidly until there is a destructive war. The story works effectively because, though there are no depictions of frogs or mice being harmed, children are challenged and prompted to reflect on the futility of war - particularly on the last few panels. No, he is not! The mouse wants the frog's flower and leaps upon the frog and steals it. Two large burly frogs come to the little frog's rescue and chase the mouse off. But the mouse returns, with his own friends, in an armored car (old boot) contraption, complete with machine gun and rickety wheels. The frogs flee, but set a clever trap for the mice. The trap involves the umbrella used as bait on the far side of a fragile looking bridge. The trap is sprung and the armored car plummets into the river. Things go quickly out of control thereafter and a war soon begins. Things progress to the point that the once pristine landscape is a charred and barren wasteland, dotted with wreckage. On the final panel, the same mouse and frog from the beginning of the story look back at one another - both appeared confused. The mouse holds a dead flower, the frog holds the ruined umbrella. 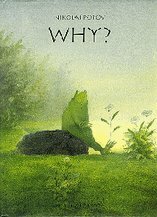 As a clinician I use 'Why' as a language stimulation resource because it is a beautifully constructed story. As a story, it follows all the elements of story grammar, in that has a strong setting, interesting characters, identifiable problems and a strong resolution. The book is also effective when teaching other elements of language including inference. For instance, on one double page spread there is a chilling scene of the mice in their jaunty jalopy driving over a rickety old bridge. Beneath the bridge are the frogs. The frogs have set a trap! One of the frogs has tied one end of a piece of string to a strategically positioned wooden support, under the bridge. The other end of the string is tied to the frog's finger and a mischievous smile is on the frog's face. Each picture has much language and inference embedded into it. It's a lot of fun discovering all the hidden messages in the story and exploring the motivations of the characters. Why, is a striking allegory of war for young children, and a highly effective language teaching tool. Highly recommended.